Posted 3 August 2018 & filed under 1930s, 1940s, Life and leisure, Margaret Brown, Oral history, World War 2. Margaret Brown was born in 1928 and lived in Boleyn Drive on the Mentmore estate, Cottonmill Lane since she was 11. She shares her childhood recollections of wandering miles over the fields with her friends and scrumping apples. She remembers one time when she was caught by the farmer in the orchard behind the Title Barn on St Julian’s farm. She and her friends also picked apples down near the sewage farm on Park Street roundabout where one of her friends fell in one of the sewage channels. 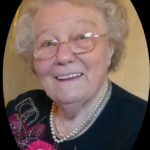 She was a child in the war and recalls the Halifax bomber planes flying low over her house, being in the bomb shelter at Beaumont school, and the sky being thick with aircraft prior to the battle of Arnhem or D-Day landings.